Sandy Bonnyman led the way for other marines during a bloody assault and earned the medal of honor. Four Medals of Honor were awarded for acts of conspicuous gallantry during the invasion of Tarawa atoll in the Pacific during World War II. It is perhaps indicative of that four-day ordeal that three of them were awarded posthumously. The citation most covered in the press at the time, which caught the imagination of the American public, was given to the family of U.S. Marine 1st Lieutenant Alexander Bonnyman for his actions on November 22, 1943, the final day of battle. Perhaps no other individual best represented the average American male of middle America than did Alexander Bonnyman. Born in Atlanta, Georgia, on May 2, 1910, Bonnyman grew up in Knoxville, Tennessee, after his family moved there when he was two years old. Bonnyman’s father became president of the Blue Diamond Coal Company of Knoxville, one of the widest distributors of coal for home heating at the time. Bonnyman attended Mrs. J.A. Thackston’s School in Knoxville as a youth and graduated from Newman High School in Lakewood, New Jersey, before entering Princeton University in 1928. Bonnyman studied engineering and emerged as a college football star during his sophomore year, playing guard on the 1928 Tigers football team. Ever restless, he dropped out of college in 1930, lacking the grades necessary to advance to his junior year. He finally enlisted in the Army Air Corps as a flying cadet on June 28, 1932. He attended preflight school at Randolph Field, Texas, but for reasons still unclear washed out of the aviation program and received an honorable discharge on September 19 of that same year. He found employment in his father’s company and married a local sweetheart named Josephine Bell, in San Antonio, Texas, on February 15, 1933. Always striving to improve his lot in life, Bonnyman moved to New Mexico in 1938, where he purchased a small copper mine with interest in a second in Santa Rosa, about 60 miles outside Santa Fe, and started his own small mining business at the age of 28. During this period he fathered three daughters, Frances, Josephine, and Alexandra. He seemed to have found his place in life. When war broke out in 1941, Bonnyman was exempt from service due to his age (31) and the fact that he was running a company producing strategically vital material necessary for the war effort. Nevertheless, determined to see action, he signed up once again for Army Air Corps flight training and washed out once more, reportedly for buzzing too many control towers. He then turned to the Marine Corps, which accepted him as a private in July 1942. He enlisted in Phoenix, Arizona, and received his basic training at the Marine Corps Recruit Depot in San Diego, California. “Sandy” Bonnyman, as he was known to his friends, sailed for the South Pacific in October of that year aboard the transport USS Matsonia as a member of the 6th Marines, 2nd Marine Division, headed for Guadalcanal. He served with distinction during the Guadalcanal campaign as part of a Marine pioneer unit (similar to a light Army combat engineer group), using his engineering experience during his time there to build a vitally needed bridge across the flooded Poha River. Now a corporal, at the conclusion of the campaign in February 1943, he received a battlefield commission to the rank of second lieutenant in recognition of what his superiors described as exceptional leadership skills. After a stateside leave, he saw his family for what would be the last time. Then, the Marines began intensive training for the upcoming campaign to seize Tarawa, an atoll in the Gilbert Islands. On September 1, 1943, Bonnyman was promoted yet again to executive officer of the 2nd Battalion, 8th Marines shore party, detailed to handle shore logistics and the landing of men and supplies. Bonnyman’s civilian experience, temperament, and skills were deemed ideal for the post and would come to play a vital part in the Marines’ ability to come ashore in his sector against heavy Japanese opposition. The amphibious landing on the islet of Betio at Tarawa atoll on November 20, 1943, turned into one of the grimmest bloodbaths of the entire Pacific War. Some of the landing craft in the first wave were hung up on the island’s surrounding coral reefs; many men were drowned or cut down before they had a chance to make it to shore. Those who did found only a narrow strip of beach a few yards wide with little more than a narrow seawall of coconut logs for cover. The Japanese had had months to prepare defenses on Betio, and every square foot was covered by Japanese weapons. Whole units were held up at the water’s edge or cut down trying to secure a foothold. Once the surviving Marines reached the beach, they confronted a network of Japanese pillboxes, snipers, and artillery fire. By nightfall the Marines ashore were hanging onto a tenuous foothold. Sandy Bonnyman soon demonstrated the courage and valor on that first day that gained him the gratitude of a thankful nation at the cost of his own life. When the assault troops comprising the first wave were pinned down by heavy enemy artillery fire at the seaward end of the long Betio pier, Bonnyman, acting on his own initiative, gathered a group of five men and led them across the open pier, swept by continuous Japanese machine-gun and mortar fire, to the beach beyond. There he obtained flamethrowers and demolition charges and oversaw the destruction of several enemy installations that were preventing the Marines from moving forward. Visible in the center of this action photo on Tarawa, a Marine film photographer records the swift assault against a Japanese strongpoint. Although the commander of the Japanese garrison boasted that Betio was impregnable, the Marines captured their objective in 76 hours. On the second day, November 21, the Marine advance was held up by a cement blockhouse and a large, sand-covered redoubt, later known as Bonnyman’s Hill. The blockhouse, containing at least 150 Japanese defenders, was impervious to air attack and shelling from the naval vessels assembled offshore. Destruction of this position would open a hole in the entire Japanese defensive line, allowing the Marines to pour through to the interior of the island. The Japanese position, 40 yards forward of the Marine lines, was inflicting heavy casualties. An ad hoc squad of assorted engineers, including Corporal Harry Niehoff leading a demolitions section and Corporal John Borich in charge of two fully loaded flamethrowers, was assembled. Neither of these men knew Bonnyman before that moment. The initial assault carried the men forward almost to the mouth of the Japanese position, and a number of Japanese troops were killed along the way. However, the Marines were eventually beaten back short of ammunition. As the day faded, Bonnyman surveyed the Japanese position with an experienced engineer’s eye, carefully studying the approach to the bunker, the various outlying machine-gun positions, and taking special notice of the large air vents that protruded from the top of the bunker. Tomorrow would be different. 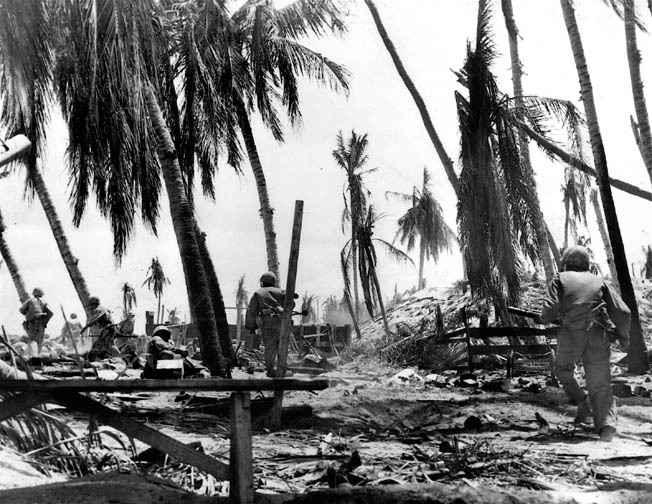 Bonnyman’s third and last day on Tarawa, November 22, dawned bright and clear to find the Marines still pinned down in the same positions they had occupied on the previous day. Under the sweltering tropical sun the temperature soared to 110 degrees Farenheit later in the day. By this time another individual had attached himself to Bonnyman’s squad, a Marine Corps photographer by the name of Corporal Obie Newcomb. Newcomb quickly realized he was in the presence of someone unusual and decided to follow the lieutenant’s assault with his camera. The action he was about to record belied the oft-repeated Hollywood myth of Bonnyman strapping on a flamethrower and singlehandedly taking on the Japanese. What happened that day was the result of teamwork, but also the intelligent, selfless, and absolutely fearless leadership of Sandy Bonnyman. When Bonnyman sensed his team of 21 men was ready, he instructed his fellow Marines to lay down a withering covering fire. Rifles, automatic weapons, and mortars cut loose as Bonnyman vaulted over the seawall, darted for the protection of a nearby wooden fence, and crawled his way to the edge of the bunker. At regular intervals the others made their way over. At a signal the covering Marines shifted their fire higher, and Bonnyman’s group prepared for the final assault. What happened next was witnessed by hundreds of Marines that day, each remembering a little piece of the swirling action from his unique vantage point. Bonnyman’s men scrambled up the sandy slope of the 10-foot-high mound covering the bunker, each trying to maintain his foothold. They immediately attracted the fire of Japanese guns, and the small group began taking losses. Corporal Borich made it up the left side of the bunker, cremated the nearest enemy machine gunner with his flamethrower, then unleashed a longer blast of napalm to cover the approach of Corporal Niehoff, who threw a short-fused TNT charge to the top of the bunker. Though doing little physical damage to the emplacement, the resulting explosion and smoke provided enough of a distraction for other engineers to begin tackling the vulnerable air vents. In the midst of this chaos, Major William Chamberlain, the executive officer of the 8th Marines who was in charge of the Marines providing covering fire, shouted “Go!” and instantly 30 or 40 more Marine began flying up the deadly slope. Corporal Borich exhausted his flamethrower against the remaining machine-gun nests protecting the bunker, while Bonnyman and Niehoff took up prone positions atop the eastern edge of the bunker to provide protective covering fire for the rapidly advancing infantry. All at once, over 100 Japanese soldiers began swarming out the bunker. The Marines scrambled for clear shots. Pfc. Bill Fratt remembered cursing the slow speed of his bolt-action Springfield rifle. The crew of the M4 Sherman tank named Colorado fired a single canister round, instantly cutting down several dozen fleeing Japanese. Other Japanese stopped and raised their muzzles, firing back at the Marines. A vicious, close-range shootout ensued, with Bonnyman yelling for more demolition charges to toss down the mound’s southern slope. He personally killed three Japanese soldiers before he was cut down. Corporal Newcomb was the only other Marine in the action who knew Bonnyman on sight from the previous day and was able to track his movements throughout the battle. “He didn’t have to go up to take that blockhouse,” he wrote in a letter he sent to Bonnyman’s family, “but there was no stopping him. It was a perfect hell hole and the boys needed a little urging when things started to break. I can still see him waving the boys up over that blockhouse and hear his southern voice urging them on. He was one of the bravest and most courageous men we had with us.” Bonnyman was 33 years old when he died. The battle continued for what seemed like an eternity but was in reality only a matter of some 10 or 15 minutes, until all the Japanese were flushed out and eliminated and the blockhouse destroyed. A Japanese counterattack was swiftly beaten back. Survivors of the assault ended up utilizing two 54-pound blocks of TNT and an entire case of gelatin dynamite on this blockhouse alone, with engineers applying each of these charges by hand, literally hugging the deadly fortification in the process. Marines rush forward in support of the initial attack against a Japanese strongpoint at Tarawa. This photo is one of a series that captured the sequence of events and was taken by Marine Corporal Obie Newcomb. A bitter Niehoff looked for Bonnyman’s body after the shooting had died down. “His body was still in the same position on the edge of the shelter, next to a Japanese machine gunner, as when I left him. But no one knew who he was until they read his dog tags. He was already unrecognizable.” Of Bonnyman’s 21 Marines, only 13 survived the assault. Major Chamberlain, along with Corporals Niehoff and Borich, provided enough eyewitness corroboration for Marine Maj. Gen. Julian Smith to recommend Sandy Bonnyman for the Medal of Honor. Sometime during the review process the recommendation was downgraded to the Navy Cross. But to its credit, the 2nd Marine Division persisted, and eventually the Navy Department reversed its decision and awarded Alexander Bonnyman the posthumous Medal of Honor three years later. All of the action was captured in a series of remarkable still photographs taken by Obie Newcomb. Never before or since has a Medal of Honor winner been photographed during the action that earned him the award. Because of the achievements of Bonnyman’s “Forlorn Hope” squad, a breach was made in the Japanese lines enabling the leathernecks to proceed to the interior of Betio, rolling up Japanese positions as they went until all resistance ceased and the islet was declared secure later that same day, with the final actions taking place on the 23rd. The location of Bonnyman’s remains along with dozens of others who died on that island was lost to history. Some early accounts have his body being buried at sea, though most likely he was placed in an unmarked common grave with other Marines who died on Tarawa and covered with sand by a bulldozer. The Marines buried their dead quickly in the humid tropics where they fought, hoping to retrieve the bodies later. For decades, the whereabouts of Bonnyman’s remains were unknown. There are no neatly tended military cemeteries on Betio. On this overcrowded, trash-littered Pacific islet, construction projects routinely turn up skeletal remains. The U.S Defense Department’s Prisoner of War/Missing Personnel Office maintains that Bonnyman’s body was “non-recovered.” Other sources say that his body lies in Oahu’s Memorial Cemetery of the Pacific. His Marine casualty card lists both a temporary grave used immediately after the battle and a “memorial” grave with a marker but no body. History Flight and WFI Research Group raised $90,000 and used ground-penetrating radar and GPS technologies along with military records to locate the possible remains. A recovery of the remains on the Tarawa atoll could potentially be the largest identification of American war dead in the nation’s history. Finding his grandfather’s remains is the goal of Clay Bonnyman Evans of Niwot, Colorado, Bonnyman’s last living grandson. Evans has made the trip in person to see the remains of the bunker where the grandfather he never knew won the Medal of Honor. Evans is a writer for a local newspaper and is writing a book about his grandfather. “That trip to Tarawa has been the dramatic centerpiece I have been waiting on. This is not only about me, our family putting an end to the war and family heroes, but it is also about the Marines not leaving anyone behind,” he commented. Evans said he was not able to get to a site on the north side of Betio where some JPAC members and others think Bonnyman might be buried. He did, however, walk up to the bunker, which is named for his grandfather. “I got up on top and there was still sand and weeds,” he said. Though she was only seven years old when her father left for the war, Frances Bonnyman Evans said she remembers Sandy as “tall and handsome, very outgoing with lots of friends and I gather, somewhat impetuous.” She explained that his leadership role and impressive performance at Tarawa were a reflection of his adventurous nature. “He was a reckless sort of person,” said Gordon Bonnyman, one of Alexander’s brothers, in an interview for the Veteran’s Oral History Project at the University of Tennessee in April 2000. Gordon served with Merrill’s Marauders and was stationed in Burma when he got a letter informing him of his brother’s death in battle. In addition to the Medal of Honor, during his 16-month career in the Marines, Bonnyman also earned a Purple Heart, Presidential Unit Citation, the Asiatic-Pacific Campaign medal with three bronze stars, and the World War II Victory Medal. The Medal of Honor was presented to his then 12-year-old daughter, Frances Bonnyman, by Secretary of the Navy James F. Forrestal during ceremonies at the Navy Department in Washington, D.C., on January 22, 1947. Sandy Bonnyman’s legacy lives on not only in the many family members who followed him to Princeton, but also in the two memorials on campus that bear his name. One is inside the Nassau Hall Memorial Room, where Sandy’s name is inscribed on the list honoring university casualties in World War II. The second is a bronze star that rests on the window ledge of his former dorm room, Blair Hall 54. His star is one of the many visible in campus dormitories, meant to commemorate those alumni who died in combat in World War I, World War II, Korea, and Vietnam. Bonnyman’s legacy lives on. Thanks to the series of extraordinary photographs by Obie Newcomb, his actions—whether noted by name or not—have appeared in newsreels and documentaries of the battle for Tarawa. He will forever be pictured as a true leatherneck, going over the hill with his fellow Marines, to meet whatever fate lay beyond. Tags Alexander Bonnyman, Allies, Axis, Battle of Tarawa, Guadalcanal, Japan, Japanese, medal of honor, medal of honor recipient, Pacific Theater, Sherman Tank, Tarawa, U.S. Army Air Corps, United States Marine Corps.